Slow Start. Historic Middle. Hollywood Ending. 150 pages into the book – where, in my opinion, the ideal book would be reaching a climax – this book finishes with its exaggerated introduction and begins in earnest. That’s 150 pages of pure set-up. None of this jumping into the middle of the action nonsense, this book spends a long time setting up the slightly irritating central character as well as establishing the threads of history that are going to be paralleled in the middle section. It takes about 125 pages too long to do this. What doesn’t help is it is written in a prosaic style which, whilst fitting the character of the narrator, seems very flat after the Wodehousian style of the author’s earlier works. Towards the end of the first ‘book’, there’s an exciting bit, when the discussions and setting up have finished and the transition into the second part of the book is created. This is marked by the use of screenplay format. Screenplay format makes the pages turn faster because there are fewer words in descriptions and also makes the action more immediate as it is written in the present tense. In the central section, we are back in prose, but now the prose doesn’t drag. The middle is where the meat is: It depicts a well-constructed alternate universe where the balance of power is completely different to how it is now. A world where the US is the underdog and stuck in the religious, homophobic, apartheid-like society of the 1950s. It’s a brilliant piece of “what-if” thinking. The question in this case, “What if Hitler had not been born and someone more calculating had filled the vacuum of power in 1930s Germany?” The realisation of the answer and the central character’s discovery of it and of how he played a part in it is compelling. Of course after the great middle, it would seem a shame to go and spoil it with a lousy end. But that’s exactly what happens. In fact the rot sets in before the end of the middle section, with a less explicable return to the screenplay format. This time it is for the dullest section of the part of the book, where the hero studies history and engineers a meeting. Maybe some sort of reverse mirror technique was implied. But it didn’t really work. Why have any dull bits in your book? It made you realise that if the book were turned into a screenplay, this part would not be copied directly to the final draft, but severely edited. 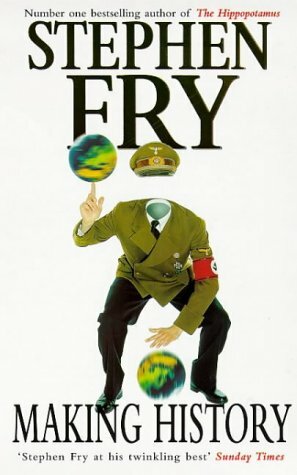 I think the problem is Mr Fry wrote it with an intention to have it made as a film. (As far as I can see this has not happened yet, but these things take a long time unless the book’s a monster hit, then they get churned out in no time.) Because of this eye on Hollywood, the end is treacly and seems tacked on (the way Hollywood endings to book adaptations usually do). The odd thing is it gives the book a definitive end – attempting to return to how things were – despite the fact the author had a continuing theme (particularly at the start) that this was part of some cyclic story line that could start “anywhere and nowhere.” It is more accurate to say the story starts nowhere and ends nowhere, but in the middle really does go somewhere. Rating: Three thumbs up (four if you only read the middle).